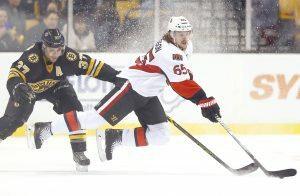 BOSTON (AP) — Dave Cameron earned his first win as an NHL coach when Bobby Ryan and Mikka Zibanjad scored in a shootout to lift the Ottawa Senators over the Boston Bruins 3-2 Saturday. Cameron took over the team after Paul MacLean was fired Monday. The Senators lost to Los Angeles 5-3 Thursday night in Cameron’s debut. Zibanjad also scored in regulation as Ottawa sent the Bruins to their fifth loss in six games. Both teams had chances in overtime. Bruins goalie Tuukka Rask made a pad save on Erik Karlsson and then foiled Bobby Ryan’s breakaway, and Ottawa goaltender Robin Lehner gloved Dougie Hamilton’s high drive. The Bruins took a 2-1 lead into the third period but Ottawa tied it with 15:43 left when David Legwand put home Kyle Turris’ rebound while Bruins captain Zdeno Chara was in the penalty box. The Bruins scored while short-handed in the first period when Chara, in his second game back after missing 19 because of an injury, flipped the puck past two Ottawa players to a streaking Craig Cunningham, who beat Lehner between his legs for his first career NHL goal. Zibanjad tied it early in the second with his eighth goal. Loui Eriksson put the Bruins ahead midway through the period when he took a beautiful feed from Kevan Miller directly in front of a helpless Lehner for his fifth goal of the season. Ottawa outshot Boston 15-7 in the second period, which also featured a spirited brawl between Boston’s Milan Lucic and Ottawa’s Mark Borowiecki. NOTES: Cameron’s only previous head coaching experience was with the AHL’s Binghamton Senators from 2004-2007. … Negotiations have started to bring the Winter Classic back to Boston in 2016, according to media reports. The Bruins hosted the outdoor event in 2010 and it’s unknown whether the NHL could return to Fenway Park or consider another option such as Gillette Stadium. … Cunningham’s first NHL goal was the Bruins’ third short-handed score of the season and the fourth Ottawa has allowed.